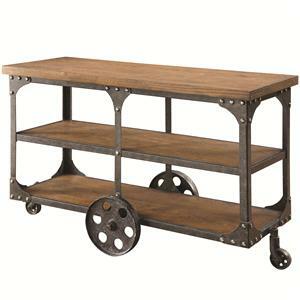 The industrial style of this sofa table is a brilliant mix of old meets new. 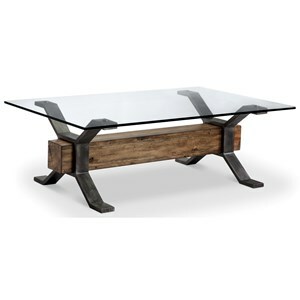 Due to its tempered glass top, the reclaimed wood stretcher is able to shine as the center piece of this table. 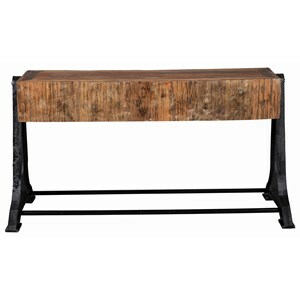 Part master blacksmith's creation, part re-purposed chic style, this sofa table is sure to be the highlight of your living room. 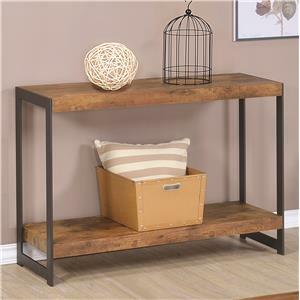 The Sawyer MH Industrial Sofa Table with Reclaimed Wood Stretcher by Magnussen Home at Value City Furniture in the New Jersey, NJ, Staten Island, Hoboken area. Product availability may vary. Contact us for the most current availability on this product. Designed to look as though taken right out of a blacksmiths shop, this collection adds a touch of modern flair to old world beauty. 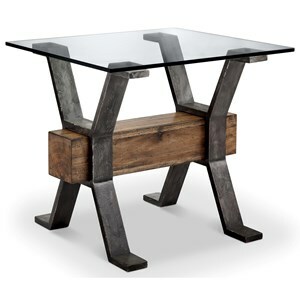 The reclaimed wood stretchers and smoked iron frame bring re-purposed industrial style to these pieces. The Sawyer MH collection is a great option if you are looking for Industrial furniture in the New Jersey, NJ, Staten Island, Hoboken area. Browse other items in the Sawyer MH collection from Value City Furniture in the New Jersey, NJ, Staten Island, Hoboken area.